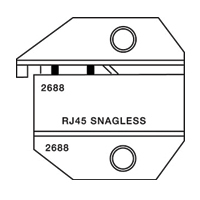 - Die set for RJ45 snagless modular plugs. Fits CrimpALL®/8000 Series and 1300 Series frames. 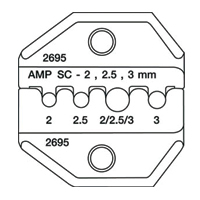 - Die set for AMP SC fiber optic connectors. 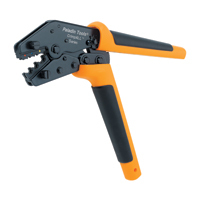 Fits both CrimpALL®/8000 & 1300 Series frames. Works with connectors with round crimp. - Crimps true 75 ohm HDTV BNC/TNC coaxial connectors. - Description: Crimps 3-piece BNC/TNC coaxial connectors. - Description: Crimps HDTV, SMA, True 75-ohm BNC/TNC & mini-UHF. - Connector style: Kings, ADC, Amphenol, etc. Paladin Tools PA8003 CrimpALL 8000 Crimper HDTV BNC/TNC CATV "F"
- Description: Crimps HDTV true 75 ohm BNC/TNC & CATV "F" coaxial connectors. 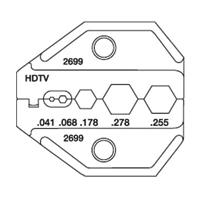 - Description: Crimps HDTV BNC/TNC true 75-ohm coaxial connectors. - Description: Crimps SMA, SMB, Mini-59 BNC/TNC and Mini-UHF coaxial connectors. - Description: Crimps Thinnet, BNT/TNC & Mini-UHF 50 & 75 ohm coxial connectors. - Connector style: Kings, ADC, etc. - Description: Crimps BNC/TNC & mini-UHF 50 & 75 ohm coaxial connectors. - Description: Crimps BNC & TNC coaxial connectors. - Description: Crimps BNC and CATV "F" coaxial connectors. Paladin Tools PA8013 CrimpALL 8000 Crimper CATV "F"
- Description: Crimps CATV "F" coaxial connectors for video. - Description: Crimps N-type, MS39012 Type coaxial connectors.